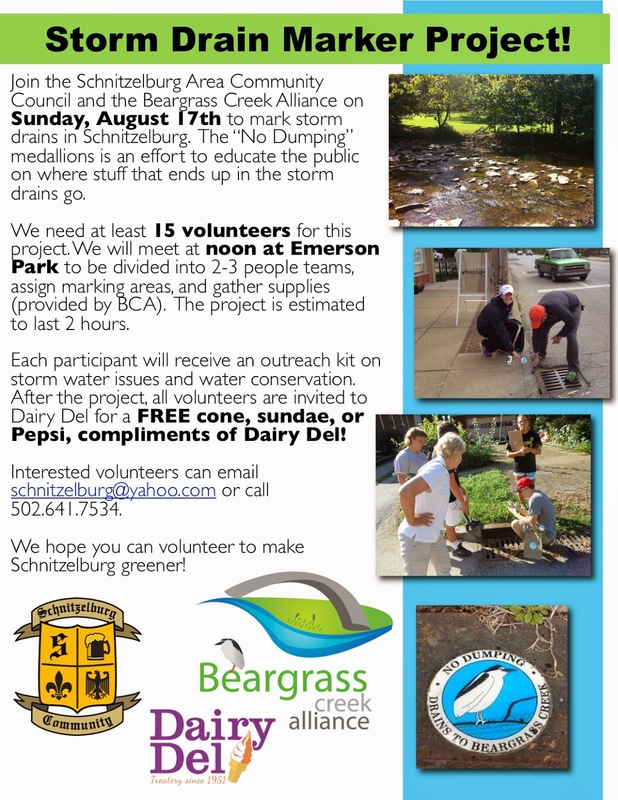 Schnitzelburg is one of the few neighborhoods in Louisville that will be outfitted with new storm drain markers, compliments of the Beargrass Creek Alliance (BCA)! The purpose of the storm drain markers is to educate the public that whatever goes into the storm drains ultimately ends up in our waterways, particularly Beargrass Creek. According the BCA, these markers "encourage 'Best Management Practices' that benefit our community's water quality regarding Non-Point Source Pollution Prevention, a major factor in the decline and degradation of water quality in Jefferson County." This project is one more way Schnitzelburg can be greener! Volunteers will meet at Emerson Park at noon on Sunday, August 17th. The project will take about 2 hours. We need at least 15 volunteers for this project. Volunteers will be divided into teams of 2-3 people. Each team will receive a map with a section of Schnitzelburg they will be responsible for marking. Each map will have the storm drains identified - easy breezy! All supplies will be provided by Beargrass Creek Alliance. All you have to do is show up! Participants in the storm drain marking project will each receive a kit to mark storm drains, educational resources, a rain gauge, a reminder magnet to limit water use during or after a storm, and native plant seeds. After the project, volunteers will gather at Dairy Del on South Shelby Street for free ice cream, courtesy of Dairy Del! If you are interested in volunteering, please email schnitzelburg@yahoo.com, call 502.641.7534, or just show up at the Park on Sunday!